Ok. Started my second batch last week. It was an American Light Ale DME from my local brew store. Followed the recipe and pitched the yeast at 68F. Put it away in my closet at 68F room temp. The next morning I went in to check and it was going crazy. The airlock didn’t pop out, but pushed most of the liquid out. The room temp was still 68F, but the bucket showed 72F. I cleaned things up and watched it bubble away. Are some yeasts faster than others? Or is 3-5 days normal? I asked this to one of the local brew shop staff and didn’t get an answer. FYI I used Muntons Premier Gold brewers yeast. The timeline of yeast attenuation is determined by many factors, including yeast strain, wort composition, OG, pitching rate, yeast vitality, and fermentation temps. Although you didn’t post your recipe I’m assuming by the name of it it would be a low OG wort. Couple that with basic light DME providing simple sugars, a healthy pitch, and your Ferm temps of 72° it doesn’t surprise me that it finished in 3 days and things are extremely quiet. Fermentation is exothermic. This is a cyclical issue. As yeast warm they become more active, which creates more heat, which creates more activity. The OG was at 1.039. The recipe called to pitch the yeast when the wort was at 70F. I waited until it was at 68F before I pitched. The recipe said to store at 72F but below 77F (which is top ideal temp for this yeast). I store it at a consistent 68F. I’m glad I didn’t store it at a higher temp or this would have been pretty hot. I’m moving to the secondary tomorrow. I’ll be interested to see the gravity reading, smell, taste, and if racking causes some of the suspended yeast to kick off a few bubbles. There are yeasts that are beasts and yeasts that are temperamental. Yeast that strive under duress and yeasts that need to be coddled. Racked it to secondary today. In the process I broke my hydrometer. No problem, I just kept going. I’ll have another chance before bottling. Color looked great and had a good taste. No off smells, etc. She also started bubbling a little in the airlock. Now, she’s in the closet doing her magic. I agree with @loopie_beer that the quick fermentation was due to your fermentation temperature. 72f is warm for most any ale yeast to ferment clean and under control. Your blow off was proof that it was too warm to control and could have produced fusol alcohol or off flavors. The temperature on your fermenting vessel is what's important. Not the room temperature. Look into ways to control your fermentation temperature. Swamp coolers work well and are about the most common low cost solutions. You'll consistently make better beer when you control fermentation temperatures. If you can't do that then look into using a more heat tolerant yeast like one of the Kveik strains. I wouldn't move this to a secondary vessel so quickly. I don't use a secondary at all but in this particular situation your beer could improve by sitting on the yeast. Racking it off the yeast cake will gain you nothing and could only risk oxidation. I'd leave it for at least 3 weeks then package it if you have a stable hydrometer reading. Yes get another one right away. The use of a secondary is a sensitive issue with most on the forum. I, in my limited experience, like it. There’s arguments for leaving it on the fallen yeast cake or getting it off due to various reasons. I’ve fallen in the camp, for now, to use the secondary. As for my temperature control, I’m going to have to look into seasonal brewing and other yeasts. I’m only going to be brewing a couple times a year and as a hobbyist I’m not going to invest $$ at this time. Living in the desert SW where we stay warm year round and triple digits in the summer this only makes sense. I’ll limit my brewing to Oct - Feb when ambient temps will range from 50-70F. As for this batch and the temps up until last night it was matching the timelines (3-5 days for fermentation - I let it go 5 days) and the temperatures range for fermentation in the recipe. The recipe calls to leave it in the secondary for no more than 10 days. 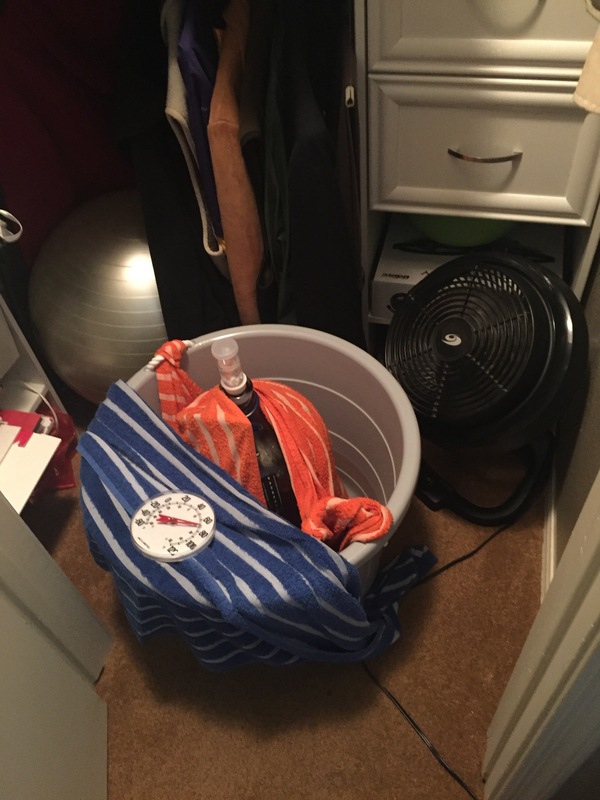 Now last night I put a wet towel around it and a fan blowing on it for the evaporative effect. This morning the temp on the carboy was at 74F. I picked up a hydrometer and plan to check the gravity today. I also want to make sure it’s not going south (smell and taste). If it appears ok I put bung/airlock in and ride it out to the end. Just FYI the temp has settled back to 70F after wetting the towel this morning. Appreciate all the help. We are supposed to hit the 90’s one day this week. I’ll let you know how this hot mess turns out. You should definitely consider using kveik strains of yeast. They're not only high temperature tolerant but thrive on temps up to 100F according to their supporters. It would greatly expand your ability to brew without temp control. @wilcolandzaat uses them quite a bit for many beer styles in his tropical climate. Yes. Perfect kind of yeast. Kveik. Been using hornedal last few times as well. Works nice in a hot environment. Checked the gravity and it’s at 1.010. The original gravity was 1.039. Both follow along with the recipe gravity readings. I did a smell check and it smells like beer. No funky orders at all. I did a taste test and it tasted good. Not funky after tastes. All in all I think she’s ok. The yeast I’m using, Munton Premium Gold, has a temp range within my temps (high end at 77F). The recipe temps are also in my range as it has you pitch the yeast at 75F (I pitched at 68F) and let it ferment at temps between 60-75F. I’m at ~70F right now and will nurse it along for the next few days. I understand the issues with the higher temps, but right now it’s all within the ranges used in the recipe. FYI the recipe I’m using is a DME with 4lbs of Munton x-light extract and 1lb of rice syrup solids. 2oz of crystal hops (1oz for bittering and 1oz for flavor) and the Munton premium gold brewers yeast. Well it’s 5 o’clock somewhere. I think I’ll enjoy a nice brew from my first batch and sit by the pool. This^^^^. I wish I had used Kveik or similar when I was starting. It took me awhile to move on fermentation temperature control, as that information was simply omitted or certainly not prominent in the initial starter kit literature/dvd etc that I got. The guys on this forum often suggested swamp coolers in similar threads and my take on this was a big Home Depot orange water cooler, about 35$, and ice packs/ice water. 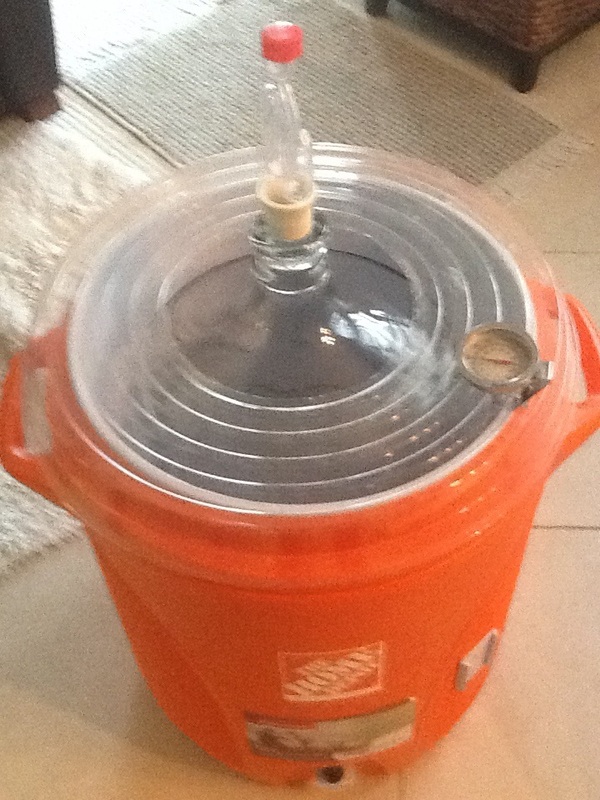 using a plant saucer with a cutout for the carboy neck. I'd cover the whole thing with towels(except for the airlock). From that point on temperature control with ales was a breeze. And similar to Arizona, its HOT here (nearly year round). Cocoa Beach Florida. As far as the secondary thing, meh,I've kind of mellowed on that....With good technique you could certainly use a secondary to brighten your beer. It's personal preference. I'm lazy so I don't. @loopie_beer does and he's a pro, so there's that. manufacturers are simply temps used by the manufacturer during testing. This does not mean it will make the best beer. Just beer. I’m pro “secondary” which is actually a brite tank. Unless of course you add fermentables. With that, you want the yeast to finish completely. Even after fermentation looks like it’s over the yeast will clean up after the party by reabsorbing or converting byproducts. Taking the beer off the yeast too quickly will prevent this. @wilco understand you’re in a tropical environment? How does swamp cooling work with your high dew points/temps? Here in the desert once the temps start to climb and the dew point drops below 59F they aren’t very effective at all. That’s our monsoon season here Jul-Sep with temps in the 110’s and humidity ~40-50%. The dew point drops and you turn on the AC. I pulled together a means to cool things down using the same principles. The towel will wick the cold water and evap takes over. This has been going a few minutes. I expect it will drop things a few degrees over the next few hours. Looks like a good setup. Honestly I wouldn't worry about it now with that beer. You kind of want it to rise a little warmer than where it was in primary to help it finish off and cleanup the fermentation byproducts. I'd say you're likely done at 1.010 considering the fermentables in that recipe, though it could drop another point or 2. If I bottled I may have a different attitude about brite tank use but all my beers go to a keg and cold storage right after fermentation is complete so they drop clear pretty fast. "So easy a caveman can do it". And it doubles as a water cooler! Thats the main reason i went to kveik yeast. Not to worry about temp control so much. For my swamp cooler i do use a. Little fan as well. Do add 2 bottles of ice in the morning. And 2 new ice bottles around 5.pm. enough to keep my temp down. Thats only if i use.different kind of yeast. Been thinking about a cooling jacket. Or build a fermetation. Chamber. I plan on letting it sit for the next 5-7 days and condition. I did this with my last batch and checked the gravity a few times near the end. It got down to 1.008, had great clarity - tastes great too! This one seems to be going along and I'm seeing some bubbles in the airlock similar to the last batch. I'll check the gravity around day 7 in the secondary along with smells and tastes. If all is well, I'll start bottling somewhere around the weekend of the 6th. By the way, I've already had the temperature on the carboy drop down to 70F from 74F a couple of hours ago. Time to take a nap on the couch while watching Gunsmoke.